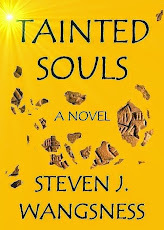 TAINTED SOULS is off to a good rating at Goodreads, with a 4.5 rating, though the math is a little funny, seeing as it's based on two reviews, but there's only one review, though the reviewer may have given it two different ratings. Got that? Anyway, the reviewer liked it, and that's what counts, right?